The Nigerian Government has urged a Federal High Court in Abuja to revoke the bail granted to Nnamdi Kanu, leader of the Indigenous People of Biafra (IPOB) and return him to prison. 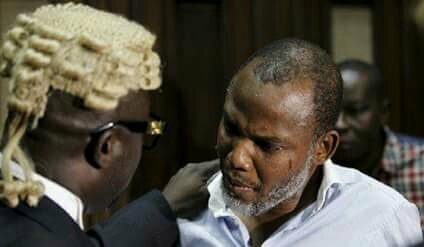 According ot the government, that Kanu has breached the conditions attached to the bail granted him on April 25 this year on health ground and has allegedly conducted himself in manners that threaten public peace. It also cited Kanu’s alleged threat that elections would not hold in South East states until the governmnet conducts a referendum on whether or not Biafra should secede. “The offence for which he (Kanu) is standing trial is not ordinarily bailable; the court, not withstanding, granted bail to the 1st defendant/applicant (Kanu) on health grounds on 25th April 2017. Among other conditions for the bail of the 1st defendant is that he should not be seen in a crowd exceeding 10 people; that he should not grant any interviews, hold or attend any rallies; that he should file, in court, medical updates of his health status every month. The bail conditions were perfected by the 1stdefendant/applicant, which he is currently enjoying”. “Rather than observing all the conditions listed above, the 1st defendant, in fragrant disobedience to the court order, flouted all conditions given by the court. The 1st defendant equally incited his members to disrupt, disallow and boycott elections in South East states, starting with Anambra State gubernatorial election scheduled for November 18 if the Federal Government failed to hold referendum for the realisation of the state of Biafra. The 1st defendant has already declared the bail conditions given by the court unconstitutional before approaching this court with the application for variation. Rather than showing remorse for his actions, the 1st defendant approached this court with an application for a review of the same conditions for the bail which he grossly flouted”. “Considering the above, that the 1st applicant has violated the conditions on which the terms of his bail were premised, we urge this court to commit the defendant to prison by invoking the provision of Section 173(2)(B) of the Administration of Criminal Justice Act, 2015. We categorically state that justice would have been denied the state by this court, if the state is not protected from the offences being perpetrated by the 1stdefendant/applicant, who is currently on bail,” the Federal Government said. Kanu and four other suspected IPOB members Chidiebere Onwudiwe, Benjamin Madubugwu, David Nwawuisi and Bright Chimezie are being tried before the Federal High Court, Abuja on offences relating to conspiracy and treasonable felony.